This all-inclusive book of scripture includes exactly what you're looking for— quality and simplicity. This triple combination is a triple threat, meeting all your needs at once. 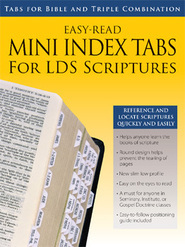 Search the Book of Mormon, Doctrine and Covenants and Pearl of Great Price with cross references to other volumes of Holy Scripture. Universally used for personal study, Sunday school and so much more, find what works for you with this amazing book. Available in hardcover and paperback. It came in the mail in six days and perfect condition with crisp clean pages.